Are you planning for a full day fishing trip out there on the water? Already have the best marine stereo with? NO! Are you kidding me? Without it, your day will be boring after a little while. Before you leave, ensure your purchase otherwise your tour will remain boring as the last time. Stereos come handy when it’s all about entertainment and communication. It is always a good idea to have something for entertainment while planning for a long duration trip. A good marine stereo can transform your time out on the water. You can instantly create a party atmosphere with latest hits or unwind with a few chilled out tunes. But the question is why marine stereo? Why not something else? Marine stereos are different and ideal for any weather condition. Besides, they are easy to carry, operate and produce quality sound anytime anywhere. Marine Stereos are designed to withstand water splashes, UV rays, and even snow! Basically, they are ideal for outdoor use. Picking the best marine Stereo is not an easy task as it assumes. The market is full with various options where the majority is useless for the price. Picking the quality option seems complicated from the local market. Today our purpose is to narrow down your choice with some of the most practical options of the present time. In our selection process, we invested two weeks. 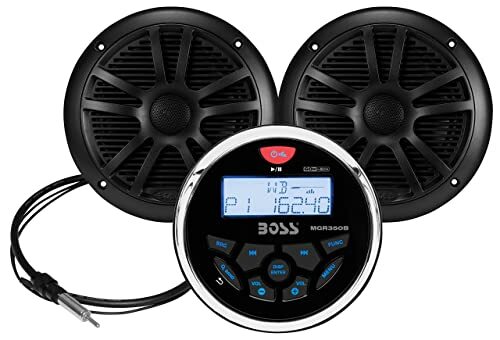 The Boss Audio MCKGB35.6 Marine Stereo is on the top of our list because of many reasons. First of all, it is an excellent quality marine stereo built to last and withstands any weather condition. The combo Kit includes a gauge receiver, one pair of MR6B.5 full-range marine speaker and an MRANT 10 Marine Dipole Antenna. You will be able to connect CD/USB/MP3 and smartphones with Bluetooth or wireless for audio streaming. The receiver is powerful with 60 watts x 4 max power. The sound quality is amazing with decent bass, treble, balance and fader controls with preset built-in EQ. The speaker is powerful as well. Everything of the marine stereo is fantastic, yet the price is low. Give it a try, and you will love it. 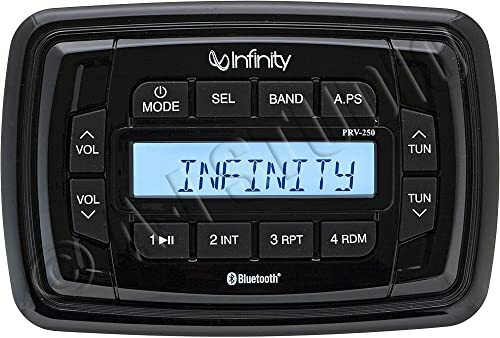 The Infinity AM/FM/USB Bluetooth Multimedia Stereo INFPRV250 is another fantastic option for outdoor use. It is fully waterproof. It offers single-line LCD display to check status and commands properly. The built-in Bluetooth with the stereo is powerful, and it supports audio streaming. The range of the Bluetooth is up to 32.8 ft. It works with most Bluetooth enabled devices. The stereo has 24-bit Digital Analog Converter that enhances MP3/WMA playback. The sound quality is pleasing to the ear. It is ideal for any outdoor use. The price of the product is reasonable. The design not so attractive. Still, the marine stereo is worth shopping for the price tag. The Marine Stereo Receiver Speaker Kit is another excellent choice. The head unit receiver is pack with single DIN universal size standard at 200-watt power peak which supports MP3, WMA and CD, CD-R, CD-RW disc. It is ideal for boat, marine, watercraft, automobile and so on. The built-in Bluetooth for wireless music streaming is powerful than many other products in the market. The display is practical and efficient as well. The stereo also has an illuminated front panel button controls for rear panel RCA and preset Equalizer. It also has 30 AM/FM stereo radio tuning. You can play with USB flash and SD memory card. You can use it with any Bluetooth enabled device. Supports MP3, WMA, and CD, CD-R, CD-RW disc, etc. The Planet Audio PGR35V IPX6 Rated Marine Stereo is the epitome of quality and class. It offers 60 watts x 4 Max power with proper balance, fader, bass, treble, and preset built-in EQ. The stereo supports USB, MP3, FM/AM, and any Bluetooth enable smartphones. Unfortunately, this stereo cannot play CD or DVD. The Bluetooth of the stereo is powerful and offers a decent range. You can play and control music and apps like Spotify and Pandora with the device. It also features a USB charging system and built-in Subwoofer control. The item is weatherproof. That means, no matter the weather it is always on to bring the mood back. The price is reasonable as well. Arguably the Fusion Entertainment MS-RA70 Marine Entertainment System is one of the best stereo systems in the market. It is great in terms of construction quality and performance. With hi-tech features, it is one of the most popular items in the market at present. The Bluetooth is powerful and offers a decent range so that you can play with freedom. 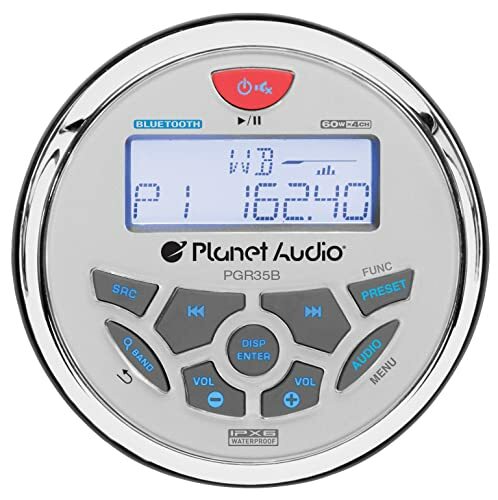 It has an interface that supports both the AM and FM frequencies as well as the iPhone, Android, and iPod. You will get a rear USB port in the device. The stereo also has a crystal LCD that is bonded optically and offers clear display in any situation. It also comes with 200w amplifier plus two zones that are discrete for the sub out and pre-out functions. The price is not prohibitive as well. 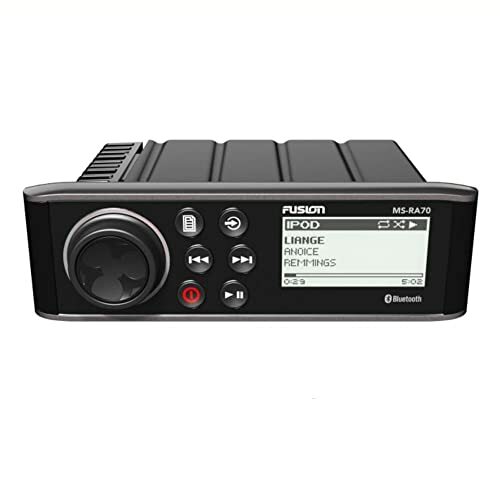 The Fushion MS-RA205 model is the ultimate marine stereo of the present time with all the useful feature to enjoy music out in the water. It is a complete package with everything one needs. With the powerful interface, you can tune both AM and FM frequencies. You can play music with USB, iPhone, iPod, AUX, Sirius XM-ready, etc. The stereo is NMEA 2000 certified, and fusion link enabled. The design is user-friendly and compact with amazing power for clear and dynamic sound. The stereo is powered by an advanced ARM-9 processor that offers quick and intuitive audio control. The display is also fantastic. Overall, it is a great product available at a great price. Click the link below; the stock is limited. When the name is Sony, the explanation isn’t necessary. We all are familiar with the products of Sony. For over decades they are making and selling fantastic quality products. The Sony DSXM50BT Marine Digital Media Bluetooth Receiver is another example of their class. 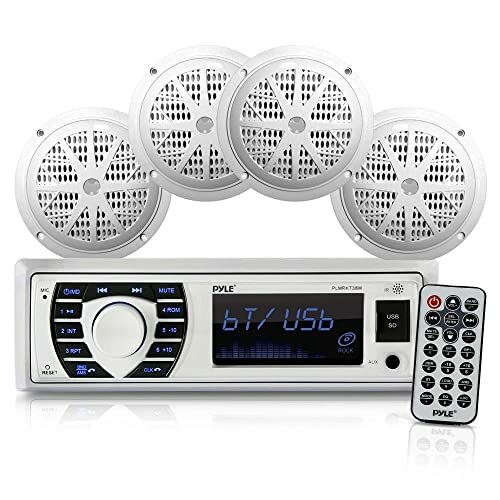 It is a great quality marine stereo set of the present time with lots of cool features. The Bluetooth it has is way powerful than many other devices in the market. You can connect any Bluetooth compatible devices with the stereo set. The construction quality of the product is fantastic with premium quality materials. It is built to last and provide excellent listening experience. The price is good as well. The Pyle is a class, period. It is another most practical Marine Stereo of the present time with lots of cool features. You will get everything from this stereo. 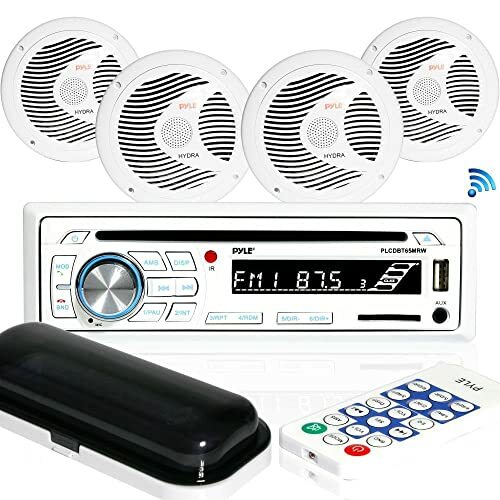 The package comes with Bluetooth Maine Receiver, Marine Grade Speaker, Speaker Connection Wire, Power and Wiring Harness, Metal Chassis Frame Bracket, Outer Trim Frame Cover and Remote Control. It is fully waterproof. The speakers offer great quality sound. It connects and streams audio from all the modern devices including smartphones, tablets, MP3 players and so on. The Bluetooth is powerful for easy wireless music streaming and hands-free talking ability. The integrated microphone on the receiver front panel is awesome as well. The controlling system is simple. Overall price is reasonable for such quality. Pick before the stock expires. The Rockville RGHR2 Marine Gauge Hole receiver is another complete package of the present time. With built-in 72×4 watt, it can peak high powered amplifier. The sound it provides with built-in EQ is soothing. The item is fully waterproof. You can enjoy any water adventure with this one. It offers a USB input system, AM/FM and direct Bluetooth audio streaming from any Bluetooth enabled device. The Display of the stereo is big and readable. Overall, it is a great product at a great price. Pick it before the stock expires. Last but not least, we have the JVC Marine Mechless AM/FM/BT Sat Ready for you in here. 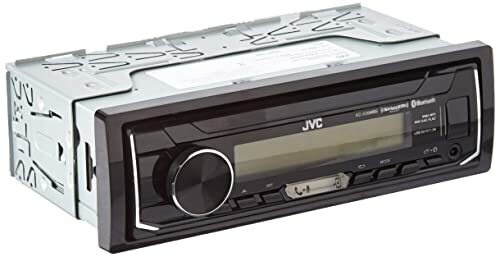 JVC is a reputed brand in the car stereo industry with their excellent quality in terms of power, sound, and construction. The JVC Marine Mechless AM/FM/BT/Sat Ready is the epitome of their class. While in an adventure the JVC stereo will make your experience memorable with music and sound quality. It has built-in Bluetooth and plenty of connections for all the digital devices. You will have a lot of options. It also has a reverse display that cuts through glare and makes receiver ideal for open top vehicles. The construction quality of the stereo is fantastic with premium quality materials. I am sure you will be amazed at the performance. Also, the price is reasonable. Give it a try before the stock expires. Shopping for marine stereo is never an easy task as it seems. You have to consider some important factors seriously. Marine stereo is not like car stereo as they usually exposed to all kind of weather condition. The following are some of the points that are extremely important to get the best marine stereo for the price. Note those considerations otherwise; you will lose in the ocean of products with confusion. Must be water resistant, no argument in this point. It must have handle splashes and light rain. Otherwise, the purpose of a marine stereo will be violated. The marine stereo must be UV resistant, no exception. If it is not UV resistant, it is not a quality marine stereo, period! You should also know about the input method, output method, control methods, and wireless functionality. 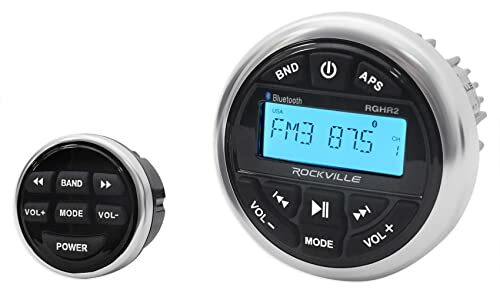 Now that we already reviewed some of the best Marine Stereo of the present time along with some important purchasing tips, I am sure you can make a wise deal. Without this guidance, picking the right marine stereo feels irritating and confusing. This is because the market is full of options where most of them are a waste of money. A marine stereo can make your journey memorable, only if you grab the right one. You are lucky as you already know your best options. Keep sharing this article so that everyone knows which one in the market is worth buying.